The Arthur M. and Kate F. Tode Hall of Fishes showcases the diversity of the Pacific with more than 60 habitats on display. Discover a stunning variety of Pacific marine life as you travel from the cold waters of the Pacific Northwest and the California coast, before heading down to the tropical waters of Mexico and across to the Indo-Pacific coral reefs. Currents make a difference. The path through the Hall of Fishes follows the California Current. This current brings cold water from the North Pacific down the coast of Canada, past Washington, Oregon, and California, and hooks westward offshore in Baja California, MEX. This current brings cold, nutrient rich water that fuels the diversity of ocean life along the west coast of North America. 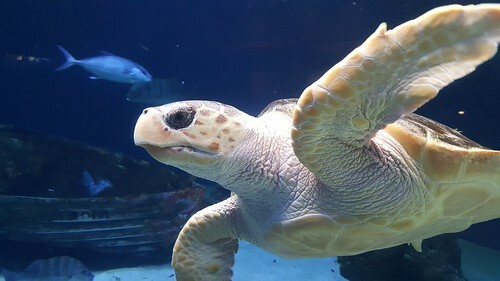 The Hall of Fishes is home to our rescued Loggerhead Sea Turtle. This young female washed ashore along the east coast of the United States and was deemed non-releasable. Check out the video below to learn more about this endangered species.